Photography and Text By Jerry Segraves © All rights reserved. 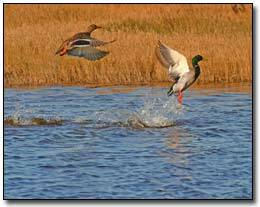 Quivira National Wildlife Refuge lays right in the heart of the United States Central Flyway for migratory birds. It also is the crown jewel in the gently undulating sand hills of the sand prairie of central and south central Kansas. Hundreds of varieties of birds call this place home if only for a brief period while migrating through. 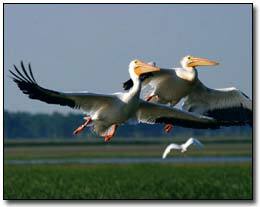 Spring and fall bring huge concentrations of migratory birds including hundreds of thousands of waterfowl and Sand Hill Cranes. Most of the native Whooping Cranes from Wood Buffalo National Park in Canada also stop by in staggered flights and may spend a few days if the prevailing winds are not favorable. Eagles, both Bald and a few Golden spend a good amount of time here in the winter, hunting injured waterfowl as well as keeping a close eye on the prairie dog population. Whitetail Deer, including some really nice bucks, abound on the refuge, as well as turkey, coyotes, bobcats, beaver, mink, all sorts of smaller critters, insects and some spring and late summer prairie wildflowers that are just spectacular. QNWR encompasses some 27,000+ acres, in which there is a lot to see and do for everyone. Bob Gress, director of the Great Plains Nature Center in Wichita, KS, and co-author/photographer for his book "Faces of the Great Plains", traveled all over the Midwest and mountain states making photos for his book and noted that Quivira is tops for wildlife viewing and photography. The refuge is well managed and it shows when you drive through. Rattlesnake Creek feeds the refuge from the west-southwest and well as some natural artesian type springs in places where the groundwater just bubbles up into the marsh. In drought years, Quivira can get very dry, but there's always just enough water to support the many birds. All seasons of the year are good times in which to visit and observe the wildlife and flat prairie landscape and scenery. Dawn and dusk normally present spectacular skies. There is a healthy population of reptiles in QNWR and prudent care should be exercised in the warm weather months for avoiding/not disturbing the native Western Massasauga Rattlesnakes. The larger ones are normally docile and somewhat lethargic, but the little ones can be a bit aggressive. Just wear pants and boots if you plan on plunging into the tall thick grass off of the roadways and mowed trails. Wearing shorts and sandals in the thick stuff would be pure foolishness! The refuge is rather narrow (approximately 2-2.5 miles wide) east and west, by rather long (17-18 miles long) north and south. A main arterial gravel road cuts through it north and south and allows visitors to see much of the refuge via automobile touring. There are a few trails to walk and many other places that are closed to vehicle traffic are open to visitors walking in. Again, if walking in areas, be prepared by dressing appropriately and carry a daypack or fanny pack with any necessities, drinking water, etc. Plan on utilizing your photo and optics gear to its full potential here and in addition to the big telephoto and zoom lenses, don't forget some wider ones for some of the breathtaking skyscape shots at sunrise and sunset. Dust from the roads can be a problem as well as unpredictable prairie weather so come prepared along those lines too. 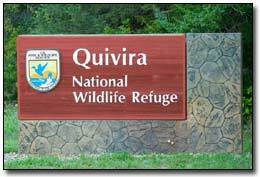 To reach Quivira National Wildlife Refuge; from Hutchinson, KS, take US Hi-way 50 west to the tiny town of Zenith and head straight north 8 miles to the entrance and headquarters (which is open weekdays), from Great Bend, KS, go south on US 281 to 4th St. Rd. and turn east for 14 miles. Jerry Segraves lives in Stafford, KS just 13 miles from Quivira National Wildlife Refuge and spends much of his free time there chasing critters around, trying to get a few photos, harassing the help, and generally being a nuisance all over the place.